For those in the know, from the early 1970s until the early 1980s, the RAF issued a series of mechanical chronographs to aircrew, all of an almost identical design. Four companies were contracted to produce these watches over that period: Hamilton, CWC, Newmark and Precista (prior to the 1970s there had been others). 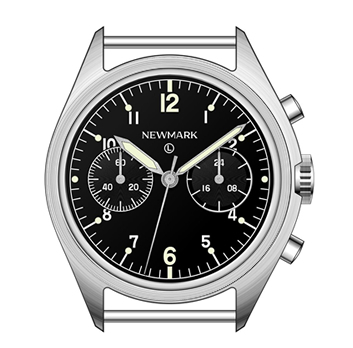 The Newmark is considered to be the rarest of this ‘Fabulous Four’. Hamilton, CWC and Precista have produced modern iterations of those watches from days gone by with only the Newmark left neglected in this regard. News is out and slowly spreading of the forthcoming Newmark 6BB Chronograph. This watch is intended to be a re-edition of the watch issued to RAF crew in 1980 but with the modern twist of a reliable meca-quartz movement. The project is in its relatively early stages but moving forward well. There is a dedicated Newmark website now online; this will evolve along with the project but for now it is possible to register for updates via the site (link at bottom). Tagged 6BB, asymmetric chronograph, newmark, RAF Chronograph. Bookmark the permalink.